Lately I've seen lots of homebrew CPUs mentioned in blogs and videos, but not too much about homebrew FPGAs. Did a little digging (mostly on Wikipedia), and was able to breadboard a basic logic cell circuit. Here's how I did it. A single logic cell. 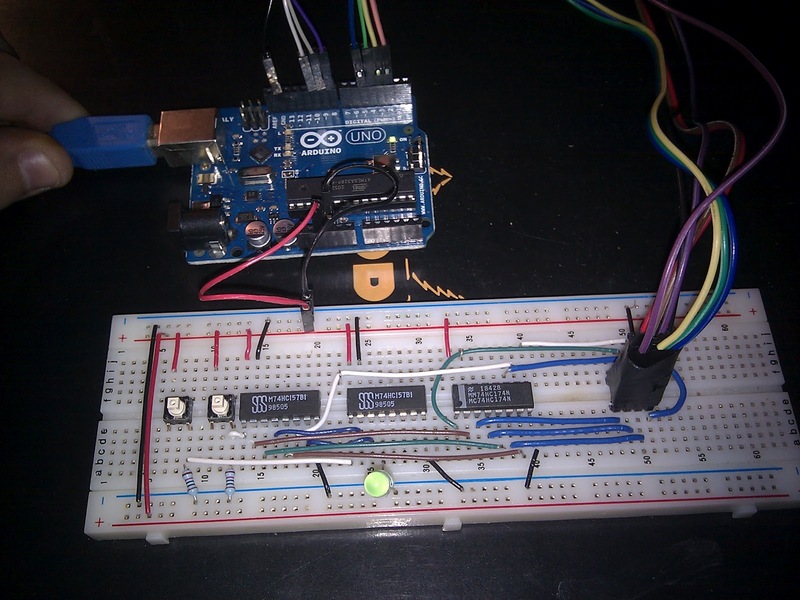 Using an Arduino to program the memory. Once the cell is programmed, the programming cable can be disconnected and the cell retains the truth table in memory. A Field Programmable Gate Array is a matrix of reprogrammable logic blocks. Each logic block contains multiple logic cells. Each cell can be programmed to function as any type of logic gate! i.e. AND, OR, XOR etc.. This matrix of blocks are then woven together in a mesh that allows blocks to interconnect with other blocks, and of course these connections can be reprogrammed any time. Today, I will focus on the logic cell. 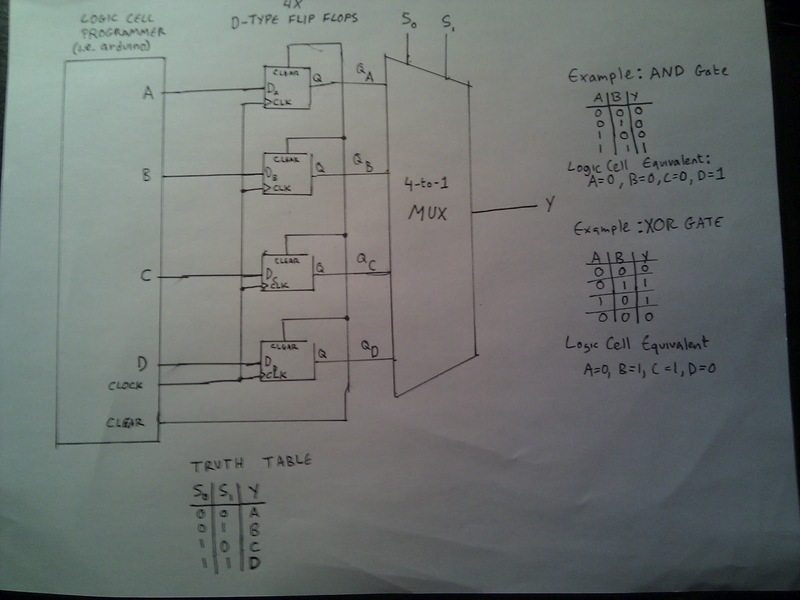 It performs a single boolean operation based on a pre-programmed truth table. Unlike when building gates from CMOS or TTL logic chips directly, The truth table is reprogrammable. For 2 input truth tables, there are 2^2=4 possible outcomes. Each of those outcomes is stored in a memory. We will use four D-Type Flip Flops (74HC174) to get the memory we need. The D-Type Flip Flop is a positive edge triggered flip flop. That means it will store the value of the data pin only when the clock pin goes high. After that, no matter what input it gets, the last value will be held, until it is cleared or a new value is clocked in. We can take 4 of these guys and tie the Clear and Clock pins together and voila - we have a 4 bit memory suitable for storing a truth table. So now that we have that in our 4-bit memory, we need a way to select one of those four values depending on what the given 2 inputs are. For that we will use a 4-to-1 Multiplexer 74HC153 (also knows as decoder or selector). Or for any of you programming nerds out there, the hardware world's equivalent to a switch statement. 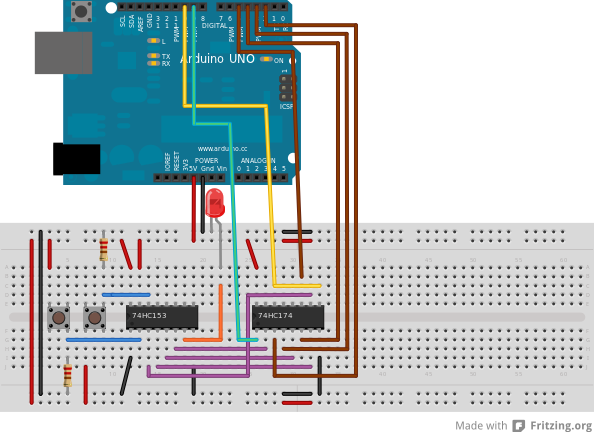 Logic cells can operate both in parallel or based on a clock. So another 1-bit memory is used to store whether the cell is clocked or not. For now I will skip the clocking part, it is easy to add it. For now I will focus on the programmable lookup table. To send a truth table to the device, you will need to type 4 letters, either capital "T" or capital "F". It's was 4 years ago, but is there another episod ? I hope to add an example of blocks and routing some point soon, will comment here when I do.